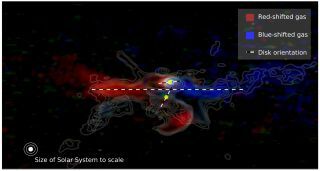 ALMA observations of the gas around the two stars called IRS 43. The colous are shown as an illustration. The gas moves in orbit around the stars, which are highlighted in yellow. The gas that’s moving away from us is represented by red, while the gas moving toward us is shown in blue. The positions of the disks are indicated by the dotted lines. Three distinct planet-forming disks, all of which are misaligned with one another, revolve around two newborn stars in a binary system about 400 light-years from Earth, a new study reports. "In addition, they have a shared disk that is much larger and crosses over the other two disks," Brinch added. "All three disks are staggered, and this breaks with everything we have seen so far." Solar systems form from huge clouds of gas and dust. Most of this material gets incorporated into the central star or stars (about half of all stars in the Milky Way galaxy are part of a binary system); the rest coalesces into a rotating disk that eventually gives rise to orbiting planets. Each newborn star generally has one such disk — though the new study shows that the situation can be more complicated than that. Illustration of the IRS 43 system showing the relative positions of the planet-forming disks. The two newborn stars each have a rotating disk of gas and dust and also have a shared disk which is much larger and lies across the other two. All three disks are staggered in relation to each other. The red color indicates the parts of the disks moving away from us, while the blue shows what is moving toward us. "By studying the wavelength of the light, you can see whether the light source is moving farther away or is getting closer," Brinch said. "If the light shifts toward red wavelengths, it is moving farther away, while blue-shift light is moving closer, and thus we can see that the three planet-forming disks are almost 'tumbling around' and are skewed relative to each other." The researchers plan to perform computer simulations to better understand why the disks are skewed like this, instead of all lying flat in the same plane with one another. "Perhaps it is a dynamic process of formation, which happens often and then it corrects itself later on," co-author Jes Jørgensen, an associate professor at the Niels Bohr Institute and the Center for Star and Planet Formation at the University of Copenhagen, said in the same statement. "We will try to clarify this," Jørgensen added. "We will also apply for more observation time on the ALMA telescope to study the planet-forming disks in even higher resolution to get more detailed information about their chemical composition." The new study was published online today (Oct. 11) in Astrophysical Journal Letters.